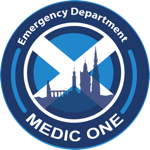 Edinburgh Emergency Medicine - Why is Edinburgh EM different? Why is Edinburgh EM different? Our specialty of Emergency Medicine, and our departments in Scotland and the UK, have been under considerable pressure in the last year or two. Through all of this, we have all been challenged on our performance against the 4-hour Emergency Access standard, our staffing levels, how we recruit and retain staff, and the balance of service provision to training opportunities that junior doctors, as well as nursing colleagues and consultants, are afforded. It is through these difficult times that the commitment to your core professional values are tested, and it has often made me think about how and why we do things in our Edinburgh and Lothian EDs. It also brings into a very clear focus the fortunate situation that we have locally. This has been emphasized still further by the brilliant improvement work that the whole team have achieved, with the help of Andy Currie on secondment with us from GSK, over the last 8 months. Firstly, we have an incredible multidisciplinary team spirit. I have often heard us described by other specialties as a "tight" unit, and the value of this is immeasurable. It allows consistency of ethos. equality of expectation, honesty and trust. This doesn't mean we necessarily are all best buddies, and in fact, we have a very wide variation in personality and interests, but we all work to a similar code of practice, with similar professional standards. Secondly, those professional standards are based around the patients' needs. This can sometimes be our undoing, whether that be taking responsibility for a patient's issues when seemingly the rest of the healthcare system has scarpered for the hills, or trying to do "too much" for a patient. However, I believe that we act unerringly as sound and vehement patient advocates, making sure we are doing the right thing, not just the easy thing. Thirdly, this tradition of patient advocacy means that we always strive to be as up-to-date as possible clinically, as well as doing all we can within our legislated time-frames to improve patient outcomes. This means not being a sign-posting service, but actually getting involved, providing critical interventions at, and sometimes before, time "zero", and being a meaningful, often highly significant point on a patient's journey. We take this role incredibly seriously, not only because we believe it is right for the patient, but also because it is what we are trained and best placed to do. Fourthly, I think we have always had a strong pastoral role in developing our doctors in training, and I think this is now in a better place than ever. Our EM trainees have unprecedented access to consultants, subspecialists and subspecialty training, simulation opportunities, research projects and career paths, and formal and informal education. We have an excellent track record of out-of-programme time, and are increasingly focusing our efforts on supporting doctors in training. As much as anything, doctors who choose SE Scotland to train in EM feel "looked after" - they are a significant part of something, the wider Edinburgh EM family. This "flat" or "soft" hierarchy not only allows them to learn from those around them, but it allows consultants and other more experienced staff to pick up innovative ideas and concepts. Finally, I believe we have a bright future. We have an excellent group of motivated consultants, nurses, managers, EM trainees, OTs, radiographers, physios, and support staff. We are changing the way we do things, to match our patient demand and get best use of of our staffing profiles. We have an active and productive research group, and there is a buzz about the place. It feels good to be at work - when did you last think that? Unscheduled care will always have its difficulties, but wouldn't you want to go home feeling like you made a difference? Come and join the EDvolution.